Everyday people experience issues with their computers whether it be a desktop or a laptop computer. Our Technicians specialize in all forms of computer repair. 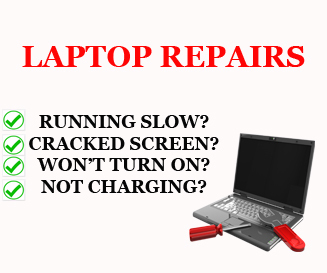 The laptop repair experts at Computer Central are able to quickly identify and repair your problems. We offer a wide variety of laptop services. Some of these services include: tune-up services, virus removal, operating system repair, internal cleaning and detailing of the system. We also provide laptop hardware repairs. These hardware repairs include but are not limited to repairing or replacing broken laptop screens, laptop hinges, replacing keyboards, replacing all hardware including memory, hard drives, optical drives, motherboards, and much more. There are a large number of issues that you may experience with your laptop. Before we repair any system we do a full diagnosis and inform you of what is involved and the cost. At this time we would offer you our professional opinion on if the system was worth repairing. In certain situations it is advised to replace the system instead of repairing it. At the time of diagnosis our technicians will let you know if it is worth being repaired. When a system is not worth being repaired we will help you pick out a replacement. If you have a problem that was not listed please call us to see if we offer it. Just because a service isn’t listed doesn’t mean that we do not offer it. On the rare occasion that we are unable to resolve your problem we can refer you to a specialist that can.